Ensure compliance across your organization at an affordable price. HCPro has brought together seven of its most popular Medicare compliance training handbooks into a single collection, offering Medicare professionals a one-stop resource for regulatory and practical guidance. 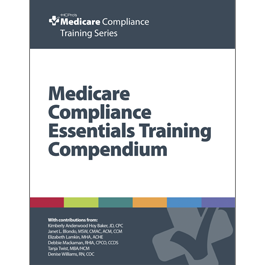 The Medicare Compliance Essentials Training Compendium is a full-size book featuring a brand-new introduction with guidelines on using the content and tools in each handbook for training purposes. The individual handbooks can also be downloaded and printed for training unlimited numbers of staff.